Bring on the resistance with exercise band workout for women allowing you to get more tone than ever. 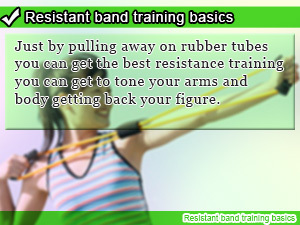 Resistant band training for toning your body the smart way. Resistance band exercising is one of those training method that doesn't get the respect it deserves. In terms of anaerobic exercise for women to tone your body resistance band training may be the best thing you picked up since buying a new pair of jogging shoes. The resistant motion of pulling on a resistance band is a great way to train your arms toning down areas left untouched by conventional exercise such as strength training with weights or walking and jogging. Resistance band training is an exercise for women that help you tone your body with exact precision. In addition to being a great way to tone up your arms, resistance band exercise can be applied all throughout your body with little burden on your body allowing you to drop the fat you don't want any more pulling apart the pounds you've always wanted to lose jumping into more efficient exercises. In this daily Slism, we will pull out are exercise bands for some the best resistance band training for women to tone your arms and boost your metabolism, going into detail about the many pros and cons of resistance training with exercise bands. The most worrisome parts of your body are those that are easy to put on fat in such as your arms, lower abdomen, hips, and thighs. Although it may be partly caused by your unique body type, worrying about putting on weight in specific areas of your body is not just you. Everybody does it! Some days when you wake up from a relaxing sleep you find time to notice that your arms are starting to get flabby and muffin tops are baking beside your pot belly. After trying diet after diet and exercise plans getting loss in the middle, there is no wonder why doing this would cause a person to worry. Before pulling away at your skin wishing there was a way out of flabby arms and muffin tops that don't necessarily mean you have two bite the bullet trying to lose weight. There's a way and that way is taking on resistance band training, the pinnacle of body toning that gives you hope to get whipped back into shape. As with other exercise equipment such as weights, bikes, ect, there are many ways you can personalize your resistance workout just by knowing the different properties of resistance bands and incorporating them in your training. Here are a few ways you can get more out of the elasticity in your bands. 1. Don't Pull Your Resistance Bands Apart! Although it is easy to get carried away pulling away at resistance bands while exercising, find other ways to vent out your stress and focus more on completing each movement with excellent form at the right pace to enhance the fat burning effects of your workout keeping in mind the image of toning your body. It's easy enough to let you form slip up during exercise developing a stoop that doesn't help you correct your posture. Whether you are sitting or standing in the midst of your workout keep your back straight. Always keep in mind the straight clean body line that you want to see show up naturally in your posture. There are many people that believe the key to getting results out of your diet and exercise program is just to do more. Although straightforward as that would be, in all practicality it doesn't always work that way. In fact, over-exercising is a more common problem that you might think. What you get out up pulling on rubber resistance bands can only be describe by the wonders it does to help tone your body unlike any other cheap affordable workout that could be done practically anywhere. Along with being relatively safe as an exercise it stimulates your muscles in ways weight training fail. These are only some of the great effects that resistant training help add value to your workout routine and even said to aid in the prevention of pelvic distortion related complication that could ruin your lifelong health. More so than the length of the resistance bands you are using, the tension strength becomes most important in being able to exercise without completely exhausting yourself. Pacing yourself is key to following through with your exercise program. Before you break into resistance band training, there are a few things that you must know to reduce the risk of injury making exercise a safer place to get fit. Making the mistake of doing resistance band training in crowded areas of the gym or your home is only asking to slip up hitting someone in the face. That's not the environment you want to create around you when you are pulling away on your bands. Keep it positive. Trying to workout with damaged resistance bands not only is not safe but also affects the tension strength of your bands. If you sense a ripe or tear in your exercise bands, replace them as early as possible not leaving chance for an accident to occur. When using equipment such as poles and wall fixtures make sure that the position of these objects are fixed in position. Failure to put your trust in fixed objects in exercise raises the risk of injury during tube exercise. Always double check the safety of the equipment you are using. When you are feeling like you're off don't force yourself to workout. In fact, doing this doesn't help you recover from what's keeping you down and could potential make it worst. Most importantly, what you should take away from this discuss is to trust your body first. If you aren't feeling good, don't push it. Just by pulling away on rubber tubes you can get the best resistance training you can get to tone your arms and body getting back your figure. Anyone who's ever been on the diet knows too well that tension builds up after anxiety not knowing where you program is heading. Band it! Exercising with resistant bands is not a fad and for from being forgotten. Don't let that stop you from bringing it back into style.